TiVo DVR 72 Hour Sale – Only $24.99/MO with $0 Down! The most powerful way to watch it all. For less. You'll love every second of the TiVo BOLT VOX 1 TB for cable with features that give you ultimate control over cable or streaming TV. Add value to your cable subscription, and record up to 6 shows at once. Broadband internet connection is required to access and receive streaming content. Availability of third-party content from streaming sources is subject to change and certain third-party fees may apply. For example, Netflix unlimited streaming membership is required (and sold separately) to access Netflix content, and Prime Video membership is required (and sold separately) to access Prime Video content. A Hulu subscription is required (and sold separately) to access Hulu content. Hulu is available only in the United States. Offer only valid April 23, 2019 through April 25, 2019, or while supplies last. Promotion is only valid in US. Offer is non-transferable, may not be resold and may not be combined with other offers or promotions. If you violate any of these terms, the offer will be invalid. TiVo reserves the right to terminate this promotion at any time, for any reason, without notice. Additional terms and conditions may apply. 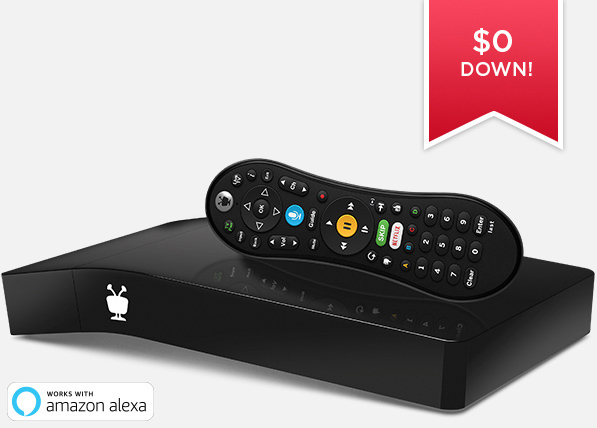 When you purchase the TiVo BOLT VOX for $24.99, your credit card will be billed each month by TiVo in the amount of $24.99 plus tax as applicable (Note: Tax will be charged based on ZIP code) for a total over the 2 year service commitment period of $599.76, plus tax as applicable. Service commitment period: 2-year commitment to the TiVo service required for this offer. Following the 2 year commitment period for any of the above products, your service plan will continue on a month-to-month basis at the same monthly price thereafter. After your 2-year commitment ends, you are under no obligation to continue your TiVo service and you may keep the TiVo box. If you cancel your TiVo service after the expiration of the TiVo 30-day Money-Back Guarantee period but prior to the fulfillment of your 2-year commitment period, then an early termination fee applies. The amount of the early termination fee will be $150 if you cancel TiVo service during the 1st through 12th months after service activation, or $75 if you cancel TiVo service during the 13th through 24th months after service activation. The TiVo 30-day Money-Back Guarantee applies solely to the initial activation of a TiVo box if you cancel your TiVo service on that box within 30 days of the initial service activation date, and if you return the TiVo box (undamaged, and including all accessories and original packaging) within 15 days of the service cancellation date, then you will receive a full refund on the purchase price (other than any shipping charges) of that box. To cancel your TiVo service, you may call TiVo customer support at (877) 367-8486 or you may cancel the service your account page on TiVo.com. Only the parts portion of the Limited Warranty covering your TiVo DVR will be extended for the length of your commitment period. Subject to the provisions of the TiVo User Agreement. Please visit www.tivo.com/legal/terms for a full description of the TiVo User Agreement. 4K ultra high-definition capability requires 4K ultra high-definition content and 4K ultra high-definition capable television. Some apps may have additional 4K Ultra HD requirements and/or limitations. Netflix users should refer to nflx.it/4K. SkipMode feature not available for all recorded shows. Voice control not available in all languages. Compatible tablets and mobile devices consist solely of an iPad®, iPhone® or iPod touch® device running iOS 9.0 or later, or an Android™ mobile device running 4.1 or above with a non-Intel or AMD chipset (sold separately). Not all recorded content can be streamed or downloaded to a laptop, tablet or mobile device (due to copy protection assigned by content provider and/or other technical limitations). Some recorded content can only be streamed/downloaded to your laptop, tablet or mobile device while you are on the same network as your TiVo BOLT VOX 1 TB for cable. Number of concurrent in-home streams depends on your network connection and the number of available tuners on your TiVo BOLT VOX 1 TB for cable. Out of-home streaming/downloading (a) will support streaming to only one of your devices at a time and (b) may not be available for all recorded content in all areas.